Fans of rock and roll can watch a re-creation of one of the most legendary live music sessions ever on stage in Sheffield next week. The show Million Dollar Quarter was inspired by the true story of the famed recording session at Sun Records in Memphis in December 1956. Record producer Sam Phillips brought together future icons Johnny Cash, Carl Perkins, Jerry Lee Lewis and Elvis Presley to create a red-hot rock and roll band. Of course, Elvis never appeared on stage in Britain but the other members of the quartet performed locally. 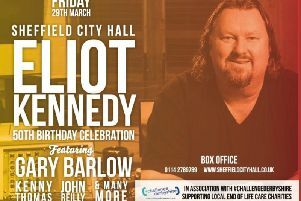 Jerry Lee Lewis appeared at Sheffield City Hall in May 1962 and 1963 and Carl Perkins played the venue a year later. Jerry Lee also played the Fiesta nightclub in February 1980 with The Memphis Beats. Johnny Cash played the city several times, including appearing at the City Hall in December 1966, October 1981, November 1984 and November 1991, plus a show at Sheffield Arena in 1992. Martin Kaye, who plays Jerry Lee Lewis, has been performing the role for several years. He and his wife bought a house in Las Vegas after the show took up residence there four years ago. It’s been a dream come true for him and the fulfilment of a childhood ambition. Martin didn’t know much about rock and roll growing up but “now it’s part of my life”. He added: “My dad is a piano player and when I was growing up he always used to do these boogie woogie songs and it was something I always wanted to do. “As I developed musically, I learned how to play that way, as well as other styles and genres, but I didn’t play rock and roll until I started this show. “Then I discovered who Jerry Lee was and read his biography. “I realised he was this wild, crazy, religious, off-the-wall, unpredictable individual. “I first went to see the show on Broadway when I was about to audition. He certainly doesn’t embrace the more controversial areas of Jerry Lee’s life, though, with his multiple marriages, often to shockingly young women. Martin recalled the story behind the show, set in the famous Sun Studios in Memphis, Tennessee. At the time, Carl Perkins had already had a hit record with Blue Suede Shoes and was visiting the studio to record some new songs. Sam Phillips introduced him to Jerry Lee Lewis, who he had signed up to play piano for the songs he was recording. Elvis Presley called in late that afternoon with his girlfriend, listened to the recording and decided to join in. Then Johnnny Cash was called and invited to sit in. All four men had southern gospel influences in common, which helped their music to really gel together. Martin said: “They were jamming together and left the tape running. “The show really gives the audience a feeling they were there, like a fly on the wall. “One of the really special things is that we all play the music live. Everything you see and hear is on stage. “It’s just an awesome snapshot of history that people can get to see. “It takes people back to that time and the music they listened to when they were teenagers. Million Dollar Quartet comes to the Lyceum Theatre on its first-ever UK tour from Tuesday to Saturday next week, starring Jason Donovan as Sam Phillips. The quartet of acclaimed performer-musicians is completed by Robbie Durham as Johnny Cash, Ross William Wild as Elvis Presley and Matt Wycliffe as Carl Perkins.